I LOVE LOVE LOVE LOVE LOVE LOVE LOVE LOVE LOVE Ciaté. My sun-and-stars (I've been reading too much Game of Thrones) bought me my very first Ciate polishes. I'd only come to know the brand when Kit launched the Ciate Caviar range. I got the email about their release, and called my boy at work frantically BEGGING him to get down there and get me one before they all sold out. Bless his wonderful little soul he did - thankfully as they sold out only days later! It was this brand recognition that got me the PERFECT gift of 2012. Him being the superstar he is, one lunch break bored and not hungry, he popped into Mecca to do a little pre-Christmas present inspiration check, and while in there, he came across their Ciate Mini Mani Set. He swore, if it hadn't been for the day I asked him to get the caviar set, he wouldn't have known the brand - and if he didn't know the brand, he wouldn't have bought me... An INCREDIBLY AMAZING advent calendar of NAIL POLISHES. OH WONDROUS PERFECT GIFT OF HAPPINESS! Thank my obsessiveness, how glad I am I called and begged for the Caviar nails!! I am a right Grinch around Christmas, but this amazing present would have had me converted, relishing every morning when I got to wake up and get out my new colour (I wouldn't have dared opening any early - the punishment for such a crime had all the polishes taken off me and given to my boy's sister - I wasn't going to have that). I can't recall what day I opened the little numbered advent flap to find Vintage. But the first day I wore it, I was wearing my favourite floral summer frock, and the colour matched perfectly to the leaves in the flowers. It was fate. Me and this colour, we were meant to be. Vintage is a dark green grey. Almost a kahki, but dark and stormier. Kahki - with personality. 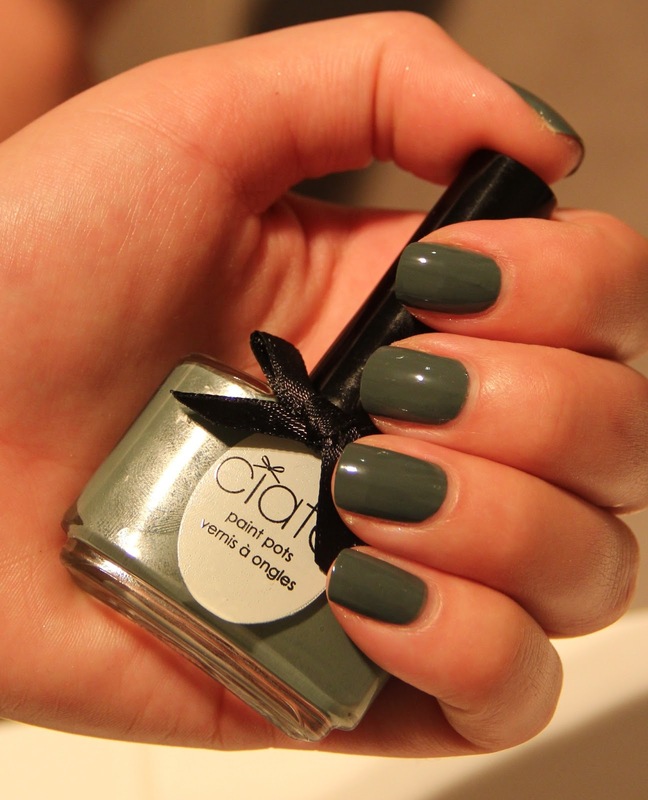 Vintage is unlike any other colour I own, and such a refreshing change to your usual dark greens or greys. The formula is amazing - my photo showing two coats without top coat - although you could get away with one. Smooth and flawless, the perfect thickness. The brushes are slightly larger, rounder and fuller than most I've used - but it suits my large nail beds (fat fingers) perfectly. Ciate's full size bottles are slightly smaller than your average polish, weighing in at 13.5ml (compared to OPI's 15ml) but their formula and bold colours more than makes up for that difference. The happiest moment in this whole happy story, was when I used the first Mini Ciate bottle. Never have I had such joy or pleasure from using a mini polish. This is a far nicer experience than the miserable few times I've dared to use OPI's minis. Ciate have put almost full sized brushes in each mini bottle, which provides a much easier application that any other mini I've ever come across. I loved this colour so much, I bought the full sized bottle for Mumsy for Christmas. She loves her green's, and I figured it would be unique enough to turn a few heads. Perfect for her. Out of amazing, I give Ciate (and Vintage) a 100.